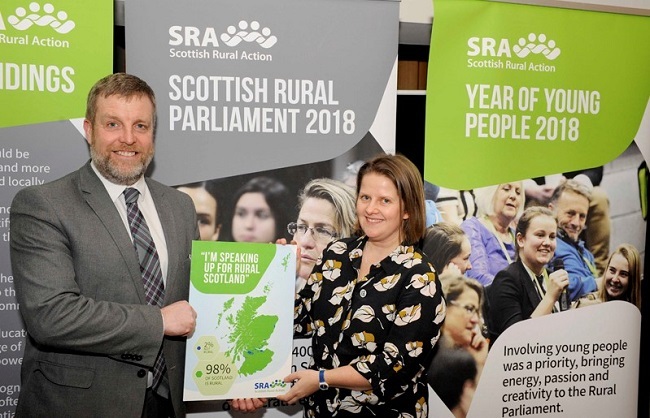 Scottish Rural Action has published key findings from the third Scottish Rural Parliament during an exhibition at the Scottish Parliament at which MSPs from all parties were invited to pledge to ‘Speak Up for Rural Scotland’. The exhibition was followed by an evening reception sponsored by Finlay Carson MSP, constituency MSP for the 2018 Rural Parliament host town of Stranraer. 1. More decision-making should be carried out at a local level, and more services should be delivered at a local level. There was consensus that rural people believe there are a wide range of issues on which their voices are not heard and needs not met by the public and private sector. It is generally believed that urban needs are prioritised because more people live there. 2. There needs to be a transparent, formalised and obligatory process for identifying rural-urban tensions and needs within the policy-making process. Rural communities require support and information in understanding how public sector decisions are made and if, and how, those decisions balance rural and urban needs. 3. The rural voice needs to be heard on issues which are key to the future and sustainability of rural communities. Too often the rural voice is often not present in the room when policy is being agreed. For example, the Homelessness and Rough Sleepers Action Group had no rural representation. 4. Communities need to be educated and supported to take advantage of new legislation designed to empower them, for example, making use of compulsory purchase legislation to build new housing. This legislation could be highly effective, but only if communities are effectively supported in utilising it and bureaucracy in doing so is minimised. 5. Rural communities can be and are agents of change. By proactively engaging with decision-makers, leading by example in terms of inclusion and being innovative in solving problems, rural communities are often the key to unlocking rural potential. 6. There is a need for increased cross-sector knowledge and experience-sharing; examining specific issues and solutions with a view to adapting and replicating the innovation which is taking place in some rural areas. Challenges can be best addressed cost-effectively through co-production and partnerships; we need to be working together to tackle those issues which are going to have the deepest impact on the sustainability of rural communities. “In many ways Stranraer was the perfect host venue for the Rural Parliament as it exemplifies many of the challenges rural areas face, such as transport difficulties, an aging population and simply not being heard. Importantly Stranraer also highlights what is best about rural Scotland, in particular its people. The publication 'Rural Voice' containing the key findings from the Rural Parliament can be read on the Scottish Rural Action website, www.sra.scot.